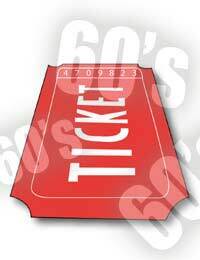 It was really only in the 1960s that tickets for concerts began to be issued with an organisation in place for people to buy in advance, especially for the bigger tours and bigger names. The most astonishing thing, perhaps, is that some original tickets have survived so long and are now on the market – keepsakes from teenage years now long in the past. Tour programmes, too, crop up for sale. Going back, they were commonplace souvenirs, a way of bringing in more money for the tour, and now worth far, far more than someone originally paid for them. The tickets represent a connection to a show. Whoever once owned it was there, and at a remove or two, so are you, a part of the greater audience. There are also those who simply just like tickets (much as there are those who collect bus or train tickets, for example). But one very good reason to collect them is that they’re one of the cheapest forms of music memorabilia. Even rarities like a ticket for the NME Poll Winners’ concert in 1968 can be found for less than £200; that might seem a lot for a ticket, but given the scarcity, and the artists (which included the Rolling Stones), it’s actually an investment. It should be no shock that most tickets turn up for the really big names – the Beatles, the Rolling Stones, Jimi Hendrix, and a few others. Those were the shows everyone remembered and the souvenirs they kept. But even Beatles tickets won’t break the bank – one, from 1966, sold at auction for £150, which is about the average price. However, an unused ticket from their 1966 U.S. tour went for much more, close to £900, and one for an early 1963 Birkenhead performance fetched only slightly less that that. Of course, the Beatles are the biggest name of all, and therefore the most collectable. Tour and festival programmes cost more than tickets. There are fewer of them around, and, apart from just having more content; they are simply a more desirable item. But even there, you can find truly rare items at relatively good prices (a Swedish Beatles tour programme sold at auction for a very reasonable £900, and a very early – 1961 – Dylan Carnegie Hall concert programme was only £600). Festival programmes can form their own little division within programme collecting, and those from the 1960s still represent very good value for money, with values that are almost certain to rise. Considering that a programme from the 1967 Monterey Pop festival of 1967 – the first of the ‘great’ ‘60s festivals - sold for around £270, it’s easy to see the potential there. In many ways, programmes have greater investment potential than tickets, being far more collectable. These days we’re used to people having passes to go anywhere, and most festivals have passes of several different colours, with different access. In the 1960s, things were far less organised – and you certainly wouldn’t have found anything laminated! Passes were unknown, and if you come across someone offering them, the best advice is to be deeply wary.